“Greater love hath no man than this, that a man lay down his life for his friends” (John 15: 13 KJV). In John 15: 13, we read that there is no greater love than for a man to die for his friend. Of course the reference is to the sacrifice that Jesus made. 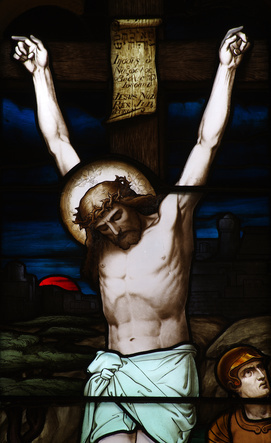 He willingly suffered and died so that we might live, so that we might escape eternal damnation. Considering that one good deed deserves another, my question to you this Easter season is this: Jesus died for you. Are you willing to die for Him? Dying for Jesus might mean simply giving up your old corrupt life and devoting all your new time and energy to His service. Are you willing to lay down your comfortable life in America and give up all to work in a poverty-stricken country like Haiti or an Ebola infected area like West Africa caring for the “least of these”? Dying for Jesus might mean defending His Word even in the face of danger. Are you willing to defend Jesus’ commandments to your death so that all will see and know them, so that His laws may stand as a beacon of light in public places along with other official documents of our culture? I could go on and on, but I ask you again: if the situation presents itself, will you die for Jesus? As Christians we are called to make the ultimate sacrifice and follow Jesus. If our love, faith, and hope are anchored in Christ, then we should be able to follow Him even to the grave. Prayer: Almighty God, we are grateful for your unselfish love. Touch our hearts so that we may joyfully return that love by demonstrating extraordinary acts love in all walks of life. In Jesus’ name, we pray. Amen. Previous Postfrom ESCAPE FOR MOTHERS OF PRISONERSNext PostWHAT WOULD YOU DO?